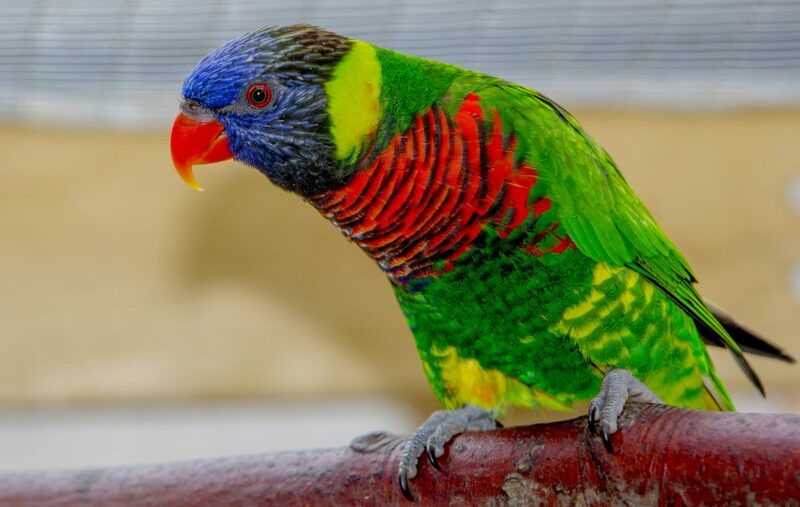 The Green-naped Lorikeet was the first lorikeet species bred in captivity. The green-naped lorikeet, also known as the coconut lorikeet, is found on Islands in Indonesia and Papua New Guinea on New Guinea, in the Bismarck Archipelago, the Solomon Islands, Vanuatu and New Caledonia. It inhabits a wide range of habitats including rainforest, open forest, woodlands, mangroves, gardens, parks, orchards, and coconut plantations where they are important pollinators of coconut species. Although most common in lowlands, they are also found in mountainous regions. Green-naped Lorikeets spend 70 percent of their time feeding primarily on nectar and pollen which their brush they extract with their brush-tipped tongues. They extend the tiny, hair-like papillae (projections) at the end of their tongue to soak up the nectar and gather pollen from blossoms after crushing the flowers with their bills. However they also eat fruit, selected greens and seeds, insects and larvae, and unripe grains of corn and sorghum. They drink surface water and that trapped by leaves. The feet of these birds have two forward and two backward facing toes. These combined with their strong bills enable them to be excellent climbers, hang up-side-down, and in general imitate Olympic gymnasts, especially when feeding. Green-naped lorikeets become sexually mature at twelve to twenty-four months old, and once paired off are thought to mate for life. They usually build their isolated nests in unlined tree hollows up to 25 m (80ft) above the ground where two eggs are laid. The male spends time in the hollow but only the female incubates the eggs. The eggs hatch after an incubation period of about 25 days. Both parents feed the chicks which leave the nest in 49 to 56 days, returning each night until they become fully independent approximately two weeks later. 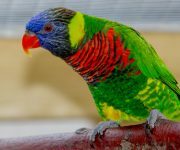 The coconut lorikeet is still relatively abundant in the wild and classified as being of Least Concern by the IUCN although habitat loss and trapping for the pet trade and as a pest has led to reduced populations in some areas.